The Edinburgh fringe attracts hundreds of thousands of tourists to Scotland's capital city every year. 'The Fringe' was established in 1947 and has now become the largest performing arts festivals in the world. In 2017 it ran for over 25 days, played acts in over 300 venues just over 53,000 times. It has become renowned as a stomping ground for some of the biggest acts, comedians and bands in the UK and is always the stage that kicked off the carrer of some of the biggest names on TV. With so much to see, and so much to do, you may understand that the city of Edinburgh can only get so big. With so many people descending on the capital every year the ability to get accommodation is dwindling. And if you do manage to scrape up somewhere to lay your head it is almost always overpriced, crowded or on somebodies couch. It may be in the spirit of the festival but it isn't everybodies cup of tea. The Kingdom of Fife sits just over the two world-famous forth rail, and road bridges and is the perfect place to stay for the festival. The sad reality of a busy festival is that accommodation will be in short supply, so the Edinburgh accommodation that is on offer is at an inflated price. Even without the festival on, Edinburgh is renowned for being a particularly expensive place to live. Some of the accommodation (even for only 2 weeks of the festival) comes with an eye-watering price tag- and for the quality, you are paying for, it almost seems not worth the trouble. In Fife, we have an abundance of quality, safe and clean accommodation that will certainly be cost effective and value for money. 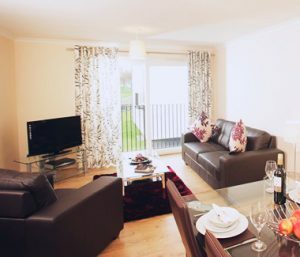 All of our apartments are HMO licenced, fully serviced and cleaned regularly. Have a look at some of the options here. The festival accommodation is quite infamously cramped, dirty and not fit for purpose. It is very well known to the locals & students that you may be asked to leave your flat during the summer to house tourists. So unless you pay top dollar, you will end up staying in somebodies student flat and more often than not, there are only singular rooms available. That isn't at all ideal for a group or family. In Fife, our accommodation is spacious & HMO Licenced so it ideal for large groups of individuals or families. There is absolutely no need to cram into a bottom floor flat in Edinburgh when you could live in peace and luxury in Fife. You may be of the opinion that one of the major attractions to the fringe is to stay right in the beating heart of the city, and you are right. Being close to the action is very important if you want to get that last minute ticket, or just have one more dram before heading home. The great thing about our location is that you can easily be in Edinburgh city centre well within half an hour. What's more, the transport links are quick, easy, cost-effective & regular (even at night) and you can get some fantastic views of the bridge. You will be far enough out of the city to have a peaceful nights sleep but close enough never to miss a second. If you're travelling with older visitors to Edinburgh, you can check out this 'dementia' map which has some great information. You can find out more information about the travel links on our Edinburgh Fringe Accommodation page. For those who are travelling to the fringe from outside Scotland, the best bit of advice we can give is to not just come here for the festival. Scotland is world renowned for its beautiful landscape, historical castles & golf courses. Fife is the perfect staging point in central Scotland to get anywhere. We have parking on site if you wish to bring your own transport, however, the bus links and train stations can take you almost anywhere in Scotland. Even the remote wilderness of Glen Coe is a train ride away, and East Lothian is well worth a visit if you have the time too, especially if you have kids. Fife is well known for the high standard of workers that it boasts across industries like plumbing, electricians and builders. Apprenticeships are popular and handed out often, and the colleges specialise in these trades. This is reflected in the quality of the buildings in Fife, and our accommodation is no exception. Over the years, we have housed many, many happy visitors to Scotland. So make Scotland your home and make an enquiry today. We are HMO Approved- What does it mean!? © 2018 Dockyard Digs. All rights reserved.